Rachel is a Senior Planner at aND Logistix. A certified CSEP, CMP professional, she has over a dozen years conference and event management experience. 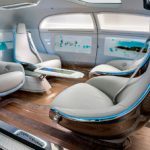 Driverless Vehicles: What Do They Mean To The Event Industry?